Amazon automatically assigns names to devices you added to your account, from the Kindle app for PC to Kindles / Fire tablets or Fire phone, and mobile Kindle apps for iOS (iPhone/iPad/iPod touch) or Android phones/tablets. It's based on your Amazon.com username, itself based on your primary email address. This quickly becomes confusing, as you can tell from the screenshot! 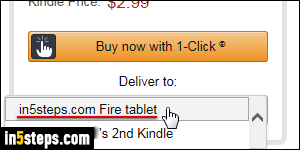 There are two ways of renaming your Kindle / Fire tablet: from the device itself, or through your Amazon.com account in a web browser. 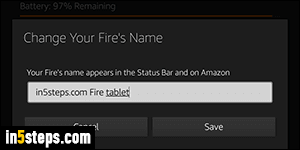 Let's change the name of your Kindle Fire from the tablet itself. Swipe your finger down from the clock to show quick settings. Then, tap on the Settings button on the right. Scroll down through the list until you find the "Device Options" entry, and tap on it. On the next screen, tap on "Change Your Fire's Name" (third option). The name that appears here is the same you find on Amazon - it's synched. 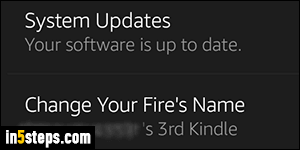 The same steps can be also used to rename your Fire phone. Type a new, meaningful and memorable name for your Kindle / Fire tablet and tap "Save". Within seconds, the Device Options screen will show your new device name: if it appears on that page and in the upper left corner of the screen (the area called the "status bar", at the very top), that means that the new name was successfully saved on Amazon's servers! You can easily verify the name change by going to the Kindle store. 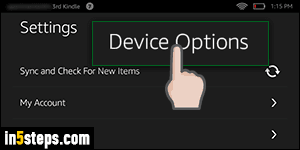 You will now see your tablet listed under its new name in the "Deliver to" dropdown menus under the Buy now and Send free sample buttons on eBook pages. 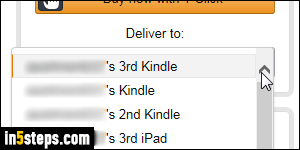 For Kindle apps, which count as "devices", or for any other Fire tablet you own, you can easily rename them from your Amazon account's device page. That same screen lets you change your default Kindle / Fire tablet for Kindle orders.